Customer satisfaction is #1 at Milestones. Please feel free to contact us with any questions or if we can be of assistance in any way. 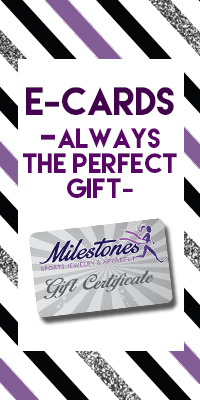 You can email us at info@milestonessportsjewelry.com or call us at 727-688-5396. We have a Jeweler on hand Monday - Friday 9a-5p (EST) to help you with any custom Running, Triathlon or inspirational jewelry designs. We look forward to hearing from you. Remember we offer 100% customer satisfaction; so if you aren't pleased with your purchase please contact us for a free return label so we can either process your return or make an exchange for you. Thank you for you for your interest in Milestones Sports Jewelry and Apparel.